Second Sight is Codemasters latest stealth/action game that puts gamers into the role of John Vatic, a man who awakes in a hospital with no memories of his previous life at all. Although John knows nothing about his former life, he is soon plagued by flashbacks and clues that gives him a vital pieces to his puzzle. Vatic soon learns that he originally worked for the military that was in charge of monitoring Russian psychic experiments and as you progress through the game, John soon discovers that he has psychic powers of his very own. 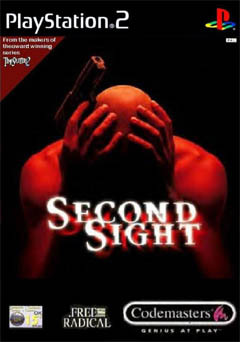 The gameplay of Second Sight is extremely reminiscent of Psi Ops but unlike the other game, Second Sight contains a much more intense and strange storyline that gamers of all ages will find compelling. As you progress through the game, Vatic soon learns to master his psychic powers and your first power in the game is telekinesis that allows you to move objects without touching them. Apart from telekinesis, Vatic also discovers that he has the power to heal, turn himself invisible and throw psychic energy at his opponents. In order to balance the game with non-psychic characters, your character is also limited to his use of psychic powers that is shown by a blue bar on the top of the screen. Fortunately, the developers have included a variety of weapons that can be used by Vatic that include your stock-standard action game variety such as sniper rifles, pistols and machine guns to name a few. Unfortunately with the good comes the bad and the enemies in the game are like the phoenix that just keep on re-spawning which does make the game a little hard at the best of times. Although there is a plethora of items and psychic powers in the game, the best mode of gameplay is stealth and if you run around like a Hollywood action movie star, then the game will become either extremely frustrating or you will give up completely... so caution is recommended. 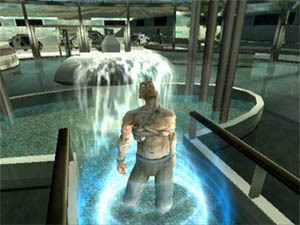 The game's storyline, although a little clich�d, revolves around Vatic discovering himself and engaging in a variety of missions that eventually leads him into becoming one of the world's most powerful psychic. 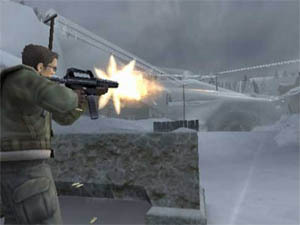 Graphically, Second Sight is a visual masterpiece on the PlayStation 2 and features some extremely impressive in-game graphics from extremely realistic and well-textured characters to some impressive looking backgrounds that go hand-in-hand with the objects and characters of the title. 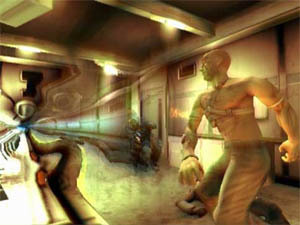 However, the game comes into its own when Vatic uses his psychic powers that contains some very impressive special effects such as the eerie blue glow, Vatic warping time itself or when Vatic goes invisible. The musical score of Second Sight has been professionally done and suits the game perfectly with its Hollywood-style soundtrack that helps immerse the gamer into the world of John Vatic. Apart from the cool musical score, Second Sight also contains some professional voice acting and of course a variety of sound effects such as Vatic using his psychic powers or the sounds of fire fights, flames and of course your foes being dispatched. In conclusion, Second Sight is a very entertaining game that mixes stealth, action and the world of the supernatural that nicely comes together in one bundle. Whether, it's Vatic being the soldier that he once was or the new Vatic who is empowered by supernatural powers, the game delivers in just about every area. If you are after a game to take your mind from things for a few weeks than I would suggest that you check out Second Sight. This may be the sleeper hit of the year!